Full disclosure: Not only doesn't this post qualify as "cooking," but I'd hardly even classify it as a recipe. Yet this astonishingly simple assembly of ingredients combines simple foods into a breakfast staple that's truly divine. Since my move from sugary breakfast cereals into adulthood I've invested a tremendous amount of time and effort into educating myself about what is good, healthy, and appropriate when it comes to a well balanced diet. This includes understanding the ingredients of foods I consume on a regular basis. My quest for a healthier breakfast started when innocently reading the side of the box of my go-to high fiber breakfast cereal. Not only was I shocked by the number of unpronounceable ingredients, but I couldn't believe that it contained artificial sweeteners! I was appalled, and knew that I could, and should, be starting my day on a better foot, fueling my body with healthier ingredients. After all, I need to at least start the day off right when my will is strong, in order to balance my end of day indulgence in desserts and...ahem...happy hour specials. After a bit of reconnaissance, I discovered this recipe a couple weeks ago, and (embarrassingly enough), have consumed it each morning since. 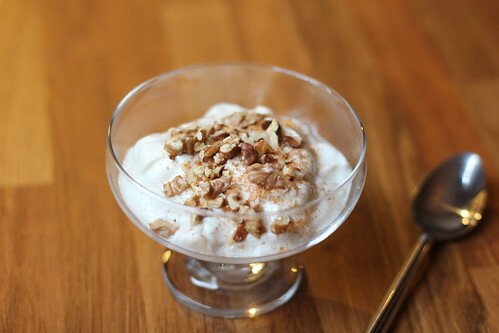 Behold the power of maple banana greek yogurt. 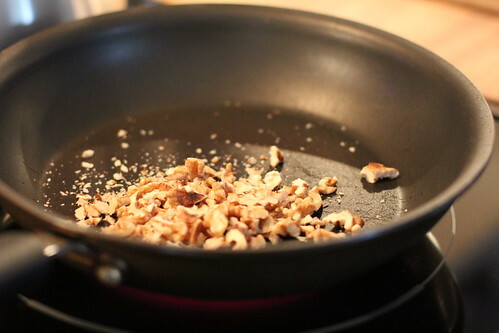 Chop and toast walnuts in a dry pan. In order to plan ahead for several breakfasts during the work week, I pre-toast 3-5 servings at one time, popping the excess in a container in the fridge. When toasting the walnuts, keep your eye on them as they can quickly go from pleasantly toasted to horribly burnt (and smelly). Typically the toasting only takes a few minutes in a dry pan over medium heat. While your nuts are toasting, start prepping the remaining ingredients. 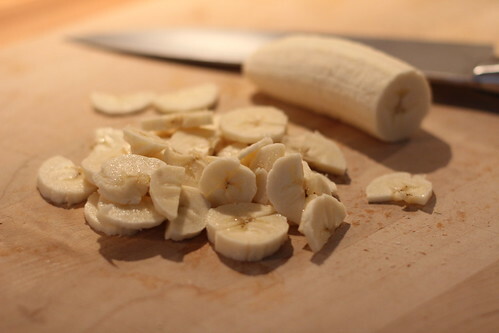 Start by thinly slicing a whole banana. 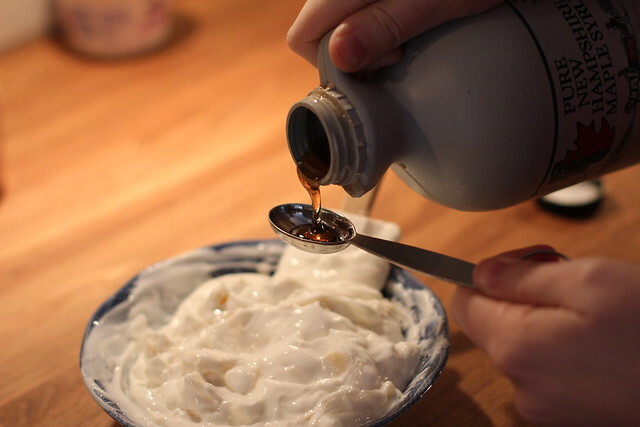 In a separate bowl, combine the yogurt and maple syrup, mixing gently. Once the syrup is sufficiently distributed, add the banana slices and mix. If desired, spoon into serving bowls for a more elegant presentation. 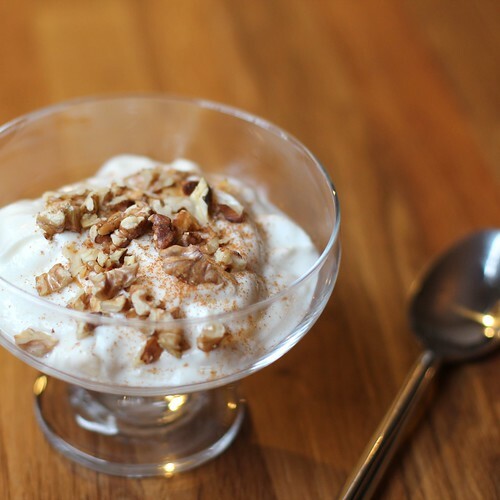 Sprinkle each with about 1/4 teaspoon of cinnamon, and top with your beautifully toasted walnuts. This breakfast checks all the boxes as far as I'm concerned. It's filling, healthy, inexpensive (at less than $1.00 per serving), just a little bit sweet, and quick to assemble. It can even do double duty as a fancy brunch item as well. Do you have a go to breakfast that makes you go bananas? It is healthy, caffeine-laden, homemade, or on-the-go? I'd love to hear how you start your day.